“From Truths to Tools” is a hand-illustrated work that masquerades as a children’s book. There are funny drawings. There aren’t a lot of words. You can read the entire 208-page book in one sitting. The book begins with an explanation of a circle and a single point, and it then shows how those simple ideas can be used to create an entire set of layout tools – a try square, a straightedge, dividers etc. that allow you to build furniture. And once you get those ideas in your head, it’s a short hop to grasp how those same ideas can be applied to building anything of any shape imaginable – skyscrapers, boats, bridges. When you can calculate if a tree will hit you when you fell it in the forest, you’ll be able to calculate the circumference of the earth. 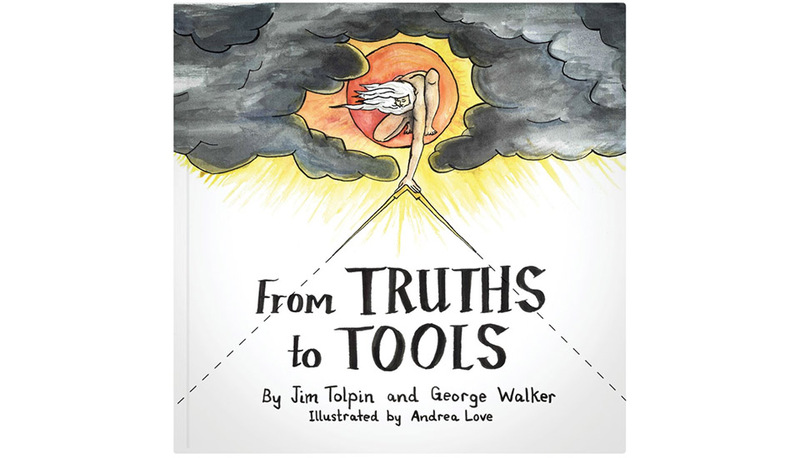 “From Truths to Tools” is the third book from the geometry-loving team of Jim Tolpin and George Walker. Their first book, “By Hand & Eye,” makes the case that simple whole-number ratios are the underpinning to the built world and our furniture. Their second book, “By Hound & Eye,” gives you the exercises that open your eyes to the way geometry and ratios govern our world. And the third, “From Truths to Tools,” shows how geometry creates our tools and, once understood, leads to a deeper grasp of the things we build, the world around us and even our language. “From Truths to Tools” is printed in the United States to exacting standards. The pages are Smythe sewn and glued so the book will last a long time and can rest flat on a bench. The pages are protected by heavy paper-covered boards. The book is designed to last several generations.